A big, fresh, hearty peach is only about 100 calories. I’m old enough to remember haunting supermarket shelves for the next shipment of Devil’s Food cookies. Turns out, the Snackwell’s name is still going strong, with an array of sweet treats. Besides On-the-Go Minis (bags of tiny sandwich cookies), Snackwell’s has 100-calorie packs of fudge- and yogurt-covered pretzels. There are often $1-off coupons available for Snackwell’s multi-packs if you want to give any of their products a try. Jello (a Nabisco/Kraft brand) has dozens of pudding varieties to offer, from nonfat to fancy mousse flavors. I’ve tried several of the 100 Calorie Packs and they’re just as tasty and one might expect from Jello. Varieties include vanilla/chocolate combo pack, chocolate-vanilla swirl, tapioca and devil’s food. They are all fat-free, but very rich in flavor. If you want to add a little extra treat, put some nonfat whipped cream or Cool Whip on top. The 100-calorie Jello packs often show up at discount stores such as Grocery Outlet, so you can get a real deal on these! I think of the 100 Calorie Little Debbie marshmallow treat as the poor man’s Rice Krispie Treat. A little gummy in texture and almost too sweet, the Little Debbie snack lacks the crunch and flavor combination of its higher-end counterpart. 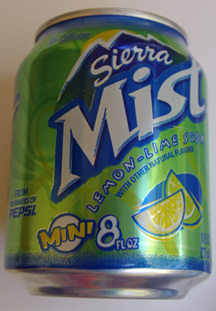 However, the treats are affordable (the pack I purchased was under $2) and portable, so I can’t complain — too much. Also, with an elongated bar shape rather than a thick square, these snacks are easier to handle and munch on the go. 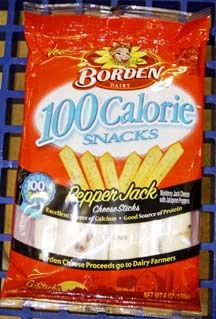 While the average individually packaged stick of cheese is normally around 100 calories anyway, the Borden company has made calorie-counting even easier and created 100 calorie pepper jack cheese sticks. There are six cheese sticks in a bag, and each weighs in at one ounce. I have to admit, I had these cheese sticks in my shopping cart when I noticed the expiration date was a little too close for my liking and put them back. However, they did look tasty, and you can’t go wrong with pepper jack. Borden also makes 100 calorie cheese sticks in sharp cheddar, mild cheddar and Monterey jack.